In 1998 Jamyang Yeshi, a talented singer and musician from the Amdo region of Tibet, fled and settled in Dharamsala, India. Over eight years in India he performed widely until his life took a different course in 2005. Jamyang was invited to Canada to perform at the Banff Centre's 'Cultures at Risk' Summit and was granted refugee status in Canada. This brought him closer to his brother, Tsundue, who had also escaped Tibet and made his home in the United States. However, both men's freedom in exile kept them continents apart from the rest of their close-knit family in Tibet. 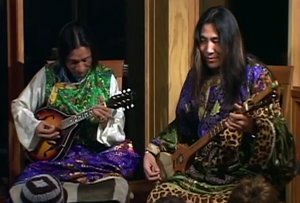 In early 2006, the Tara Café Project began work on the Shining Spirit recording and film project project which would bring the family together through their music. Over the course of three weeks, members of Jamyang’s musical family were recorded. The Shining Spirit Project is a testament to the power of music, the resilience of the Tibetan culture, and the enduring bond of a family separated by politics and geography. The film was released in September 2009 and is currently on the Banff Mountain Film Festival world tour. Digital Himalaya is delighted to host the trailer of Shining Spirit. Please click on the image below to play the film (86 MB).